The ancient Romans already used concrete and with the help of modern technology human kind is capable of creating skyscraper and long bridges using cement and reinforcement steel. Photograph concrete this week and see what shows up in front of your visionary eye and in your camera. 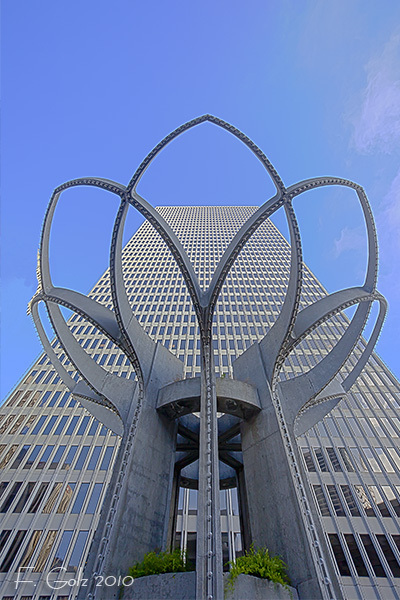 This is the “tulip” photographed in front of a high rise building. If you visit San Francisco it is located in the Embarcadero center. Enjoy and have a great week with your camera! 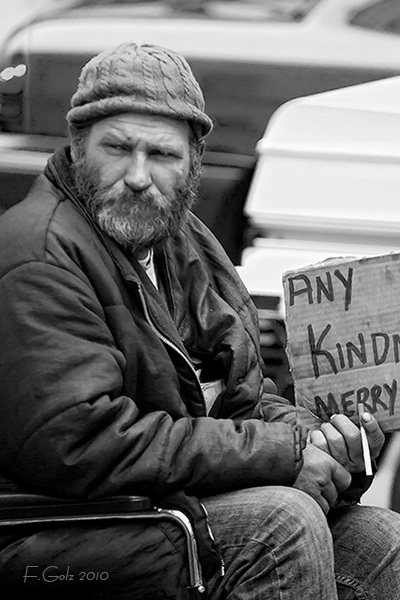 Being homeless and alcohol consumption and leaving trash behind go often hand in hand. 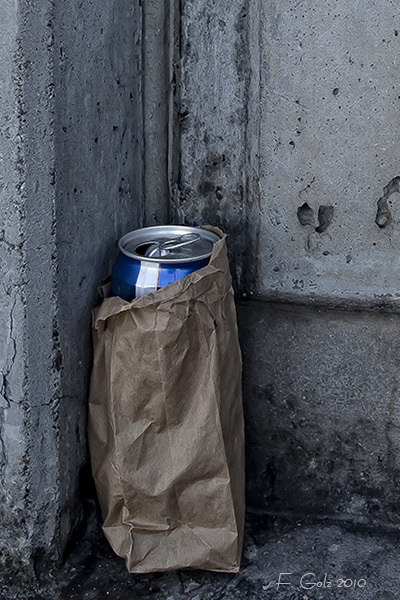 I found this beer can in a brown bag at a Bart (Bay Area Rapid Transit) station. I wonder what kind of story this beer can could tell us? Have a ncie week-end and happy photographing! I photographed this person around 2:30 PM. I really don’t know what to say and how to comment this image. It makes me feel sad and thankful at the same time. What kind of emotion does it bring out in you? 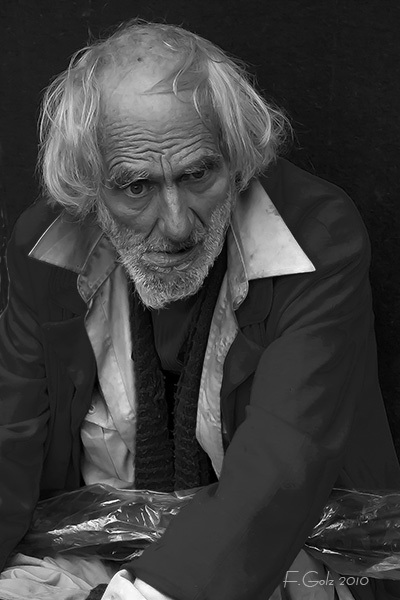 When I saw this homeless gentleman I had to photograph him. He was sitting on Market Street in San Francisco and watching the life performance of a band. From time to time he was moved by the music. When I photographed him it seems to me he was thinking about something else. Maybe the music helped to remember better days. I wonder what went wrong in his life and what could help him to see better days again. People told me before that homeless people get very attached to their animals. This gentleman was definitely attached to his cat and vice versa. In this image I tried to show the relationship of the two. They are looking at each other and his hand are embracing the cat that is sitting on his lap. Food for thought: There are many homeless cats in my community that where dumped by their owners. 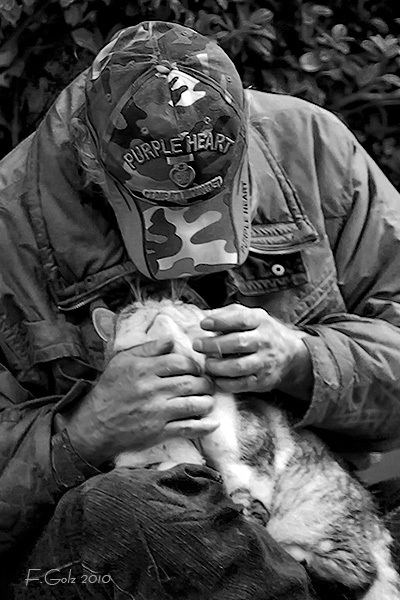 I wish the so called “civilized” people would have the same love for their animals than the homeless people have. Imagine you are a photographer for a local newspaper. 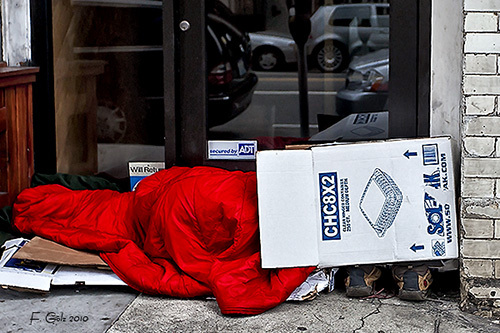 Your team-leader wants you to photograph homeless people in your community for a story. How would you do it? I photographed this homeless person at a busy street corner. I love the look on his face and how he is holding his cigarette and sign. I changed the picture to black and white and I cropped the image as tight as possible to increase any feelings the viewer might have. In addition I wanted to jump-start the mind by guessing the writing on his sign. Enjoy and as always be creative with your photography! In my first batch of photograph I tried to avoid the reflection of myself and camera tripod as much as possible by using a 200mm lens. 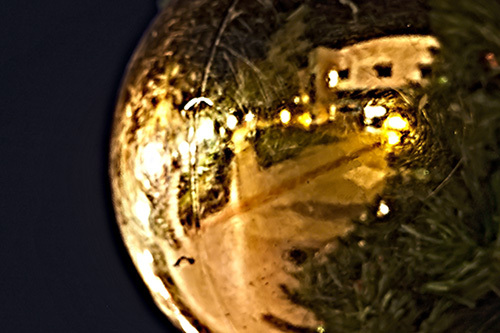 This time I wanted the reflection and I used a 28mm prime lens. 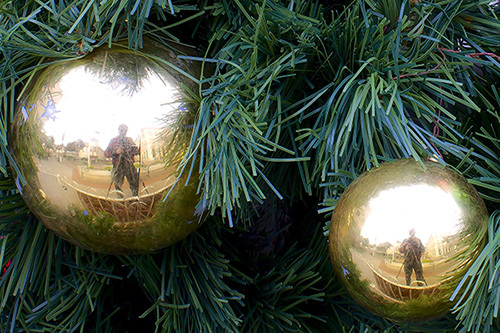 In addition I decided to create a composition of two ornaments at add tension to the image. Photography is among other things about seeing and learning new things. As a photographer you need to be always prepared for something new along the line. 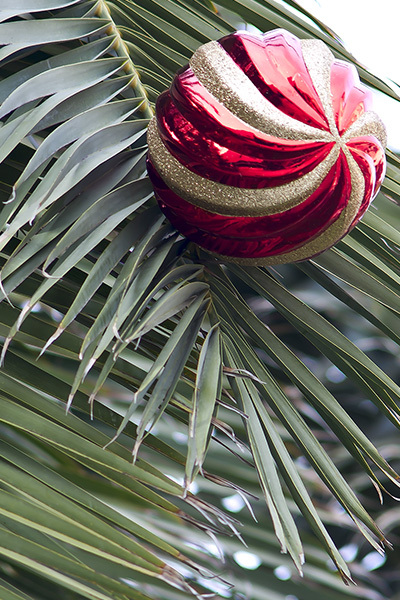 While I was photographing the big Christmas tree in downtown Merced I also discovered Christmas ornaments on the surrounding palm trees. That was totally new to me. Of course, I had to photograph it. Enjoy! 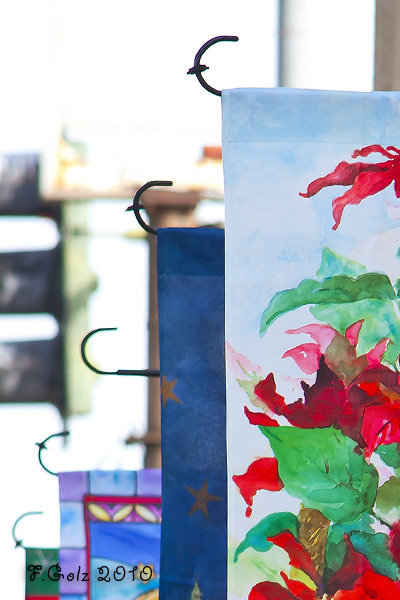 I discovered this row of Christmas flags outside a store in Chowchilla, CA. I love the leading lines in this image!